Well, have I got a special treat for you! 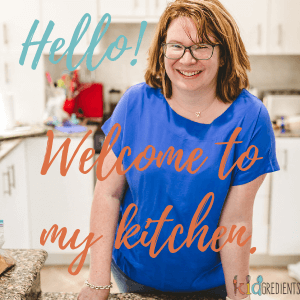 I don’t open my blog up to others without good reason, but today we have a guest post from Juliette Francois, nutritionist, mum, awesome lunchbox packer and all round cool person. This is not a sponsored or paid post, but I’d love you to show her some love at My Hungry Caterpillar- Facebook . Oddly enough, Juliette and I met via a lunchbox Facebook group and hit off. So when I saw her posting about cloud jellies, I needed to know more. If you’re looking for an extra healthy treat for the kids with wow factor, this is it. So without further rambling…here’s Juliette! Treats can be healthy! Especially when they are made with real gelatin and not that from the brightly coloured packets we see in our supermarkets. I’m talking about jelly treats made with powdered real gelatin that doesn’t contain any sugar, colours, additives and preservatives. Real gelatin has an increased nutrient profile that you just won’t find in the average run of the mill supermarket variety and by starting to include good quality gelatin in to your families daily diet, not only will you start to see a myriad of health benefits, your kids will love it too! One of the main reasons gelatin, either in the form of bone broths and stews or in its powdered form is one of the most highly recommended additions to my clients diet is because our modern diet is greatly lacking in these nutrients, today we are mostly interested in muscle meats which lack the anti-inflammatory amino acids contained in gelatin. Gelatin has long been known to be a curative for many illnesses, particularly cold’s and flu hence the reason our grandparents would always give chicken soup in times of sickness – it is incredibly immune boosting. It is fabulous for bone and joint health. It is anti-inflammatory, improves immunity and assists with wound healing. It is gut healing and hence has been seen to assist with the improvement of food allergies and intolerances. It is detoxifying to the body by helping the liver to efficiently remove toxins from our body. It assists the body to fully utilise the proteins that are taken in and hence is a wonderful way to add extra protein into your child’s diet. It is calming to the brain, improves focus, memory and assists with stress reduction. And for many parents, the most important of all; gelatin can induce sleep as well as improvethe quality of sleep. Now the health benefits don’t stop at children, gelatin is wonderful for the big kids too! In addition to the above, gelatin assists with blood sugar regulation, inhibiting sugar cravings and boosting metabolism – fabulous news for those wanting to lose weight. It also improves the strength and appearance of hair, skin, nails and teeth and additionally improves the elasticity of your skin.. what is there not to love? 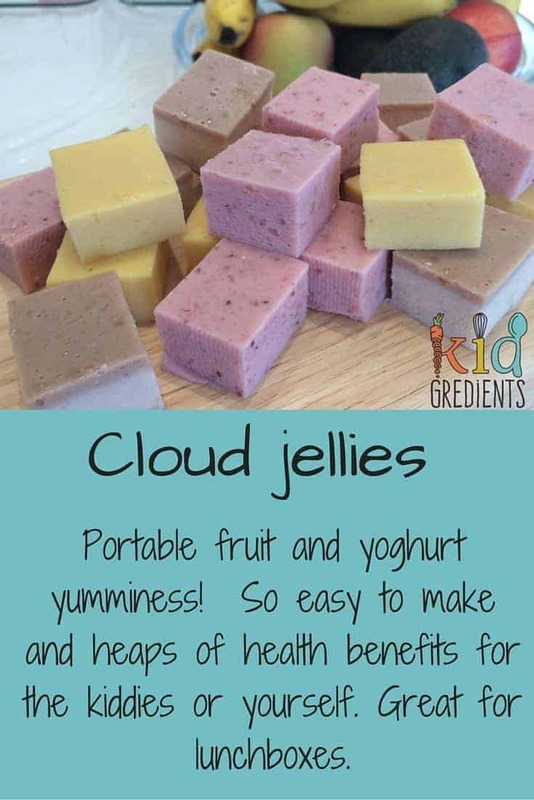 Powdered gelatin can be used in many ways to make lovely healthy treats including little homemade gummies and marshmallows, custards and panna cotta desserts as well as these pureed fruit jellies which are a family favourite. If you think these are awesome- you’ve got to try out our Blueberry cloud jelly cheesecake slice! Delicious, nutritious and oh so kidfriendly! 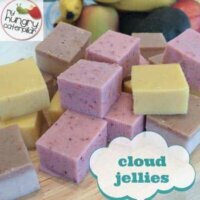 Cloud Jellies- a guest post by nutritionist Juliette Francois. Awesome yummy treat with no nasties! for 5 or so minutes so that gelatin can start to absorb the liquid. Over a very low heat, slowly whisk to dissolve the gelatin. into squares and store in an airtight container in fridge. Can I use plain Greek yogurt for this? Can I use puréed baby food pouches instead? I bought way too many and need to use them up. If I do, should I still add the yogurt? What about any other ingredients? I’ve never tried them with them, so I don’t know! You could give it a go, report back and let me know. Hi! How Can I make these dairy free for my 11 month old recovering from stomach bug? You could use coconut yoghurt? Hi, I made these yesterday.. they have been in the fridge for nearly 24hrs now but they still haven’t set! 🙁 I did use low-fat yoghurt though…. could this be why? Is there any way to salvage them? I’ve never used low fat yoghurt with these. I would blitz and freeze as iceblocks. Hi there, so my kids eat basically everything especially my daughter. They worked out perfectly but neither of them like them at all. Is there any other fab recipes down the jelly line that you know of?? I have been enjoying them but man they make loads which I have frozen. Any ideas? I just made these and so far YUMMY!!!!! I used a frozen mixed bag of strawberries, cherries, blackberries, blueberries and a banana to add natural sweetness. I also used vanilla greek yogurt and lemon juice instead of lime. I have to say the taste is great so far and they haven’t gellied yet. I can’t wait to try them out. thanks for the recipe. Hi there just wondering how long the jellies take to fully set , Should they be left overnight ? Mine only take 4-6 hours, but it depends on the weather a little as well! If it’s particularly humid, they take longer for some reason, despite being in the fridge. can we use another brand of gelatin, we don’t have those you mentioned here in my area. I want to make these for my grandson. yes you can, just don’t buy a supermarket one- people have had varying results with those! I am vegetarian–so I don’t eat gelatin–would it be possible to substitute pectin? Hi Amanda, I haven’t tried it with pectin, but let me know how you get on! Can’t wait to give these a try! Do you think Greek yoghurt would work instead of normal yoghurt? Are these able to be frozen? Yes I use Greek and they freeze perfectly! Hi anne! What quantities of beetroot did you use? Hello! Love your blog. I made theese today with strawberries, beetroot, orangejuice and yogurt… amazing flavour! Really liking the texture… amazing color because of the beetroot pure.. hot pink! I’m so glad you like them! They are so versatile! I’m making some mixed berry ones this week. Thanks for popping by! I loved this recipe, thank you! Just wondering… do you think they would last in the fridge in an airtight container for 2 weeks? I made them, we ate some and then the remainders got pushed to the back! We haven’t eaten any since they turned 7 days, I’m annoyed that I didn’t just freeze them from the start! I wouldn’t risk it after that long, as yoghurt has an open shelf life of around 7 days! Ah, of course! I was thinking more of the life of the Gelatin, I forgot about the yoghurt! Does heating it to dissolve the jelly kill the probiotics in the yoghurt and Kombucha? Not that I’m aware of, but having said that, in the one in my eBook, I just heat some water to dissolve the gelatin, you could try that! what if we cannot find gelatin in powder form, would one sheet of gelatin do? You’ll need a couple of sheets. There is powered gelatine in most supermarkets as well, in small containers like the baking powder. I’ve never done it with the sheets. Hi I made these but it tastes like I’m eating a weird rubber ball – does it really need 4 tablespoons of gelatin? Did you use all the other correct amounts? Mine doesn’t taste like that! It’s like the texture of a pannacotta! Lol. Nevermind. I see you added suggestions to the blog post. I was looking at the Pinterest recipe. What would be a good substitute fruit? My boys don’t care for mango. Can the lime juice be substituted with lemon juice or too sour?! Yes! I often use lemon juice! Love things that look naughty but are healthy! Do you think I could use coconut water instead of kombucha & coconut yogurt in place of regular? These sound brilliant and look super tasty! Just wondering how much somebody would have to consume in one day to reap the benefits of the gluten and probiotics? Also, would they melt in the lunch box or do they keep their set form for a while? Whoops! so excited, I made a typo. GELATINE, not gluten! They stay set really well in the lunchbox with and ice pack. As part of a well balanced diet, the cloud jellies are adding to the goodness that you get in a day. Even just 2 tablespoons of a good probiotic rich yoghurt per day can really help with digestion as an example! I think they would! You might need to add a little extra gelatine. Say 1/2 teaspoon more. Just wondering how long they will keep in the fridge ? 7 days, but they can also be frozen! Wow! I think this could possibly be a winner with my little guy. Thanks for sharing. Nor did I! That’s why I’m glad to partner up with people who know these things! I’ve heard such good things about Great Lakes gelatin and these look ace! Don’t they ever? I’ve got to make yoghurt tonight just so I can make these! Sounds very interesting- I wonder if I could use kefir in place of the kombucha? WOW WOW WOW. We are going to make these this next week! They look fab! Juliette really knows her stuff! I love love love this recipe!! I have been making fruit jellies for the last few months since starting the SCD/GAPS diet. This looks great with the addition of yoghurt. I shall use soya yoghurt so that my daughter can eat them. Brilliant!